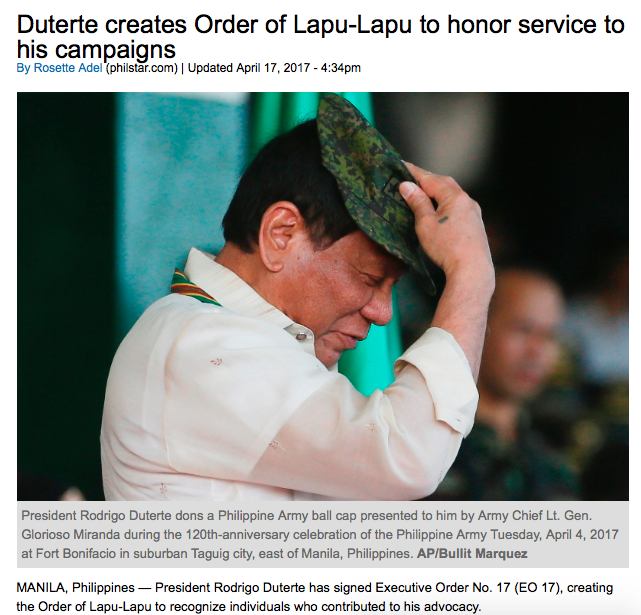 The students at the University of the Philippines are outraged that the University has offered to confer an honorary doctorate of law on President Duterte. Even though the UP has a tradition of conferring every president with this degree the students think tradition should be ignored and the degree withheld because of Duterte's war on drugs. Luckily for all involved the president has declined the honorary degree. Duterte is neither the first to be offered this honorary degree nor is he the first to decline it. Other former Philippine presidents conferred with the degree were Manuel Quezon (March 16, 1929), Sergio Osmeña (March 25, 1930), Manuel A. Roxas (April 13, 1948), Elpidio Quirino (Feb. 12, 1949), Emilio Aguinaldo (June 12, 1953), Ramon Magsaysay (April 5, 1955), Carlos García (April 7, 1959), Diosdado Macapagal (May 30, 1965), Ferdinand Marcos (May 22, 1966), José Laurel Sr. (April 20, 1969), Corazón Aquino (April 20, 1986), and Fidel Ramos (April 24, 1993). Estrada and Arroyo were also offered the honorary degree but they turned it down. It is not true that Duterte does not accept awards. 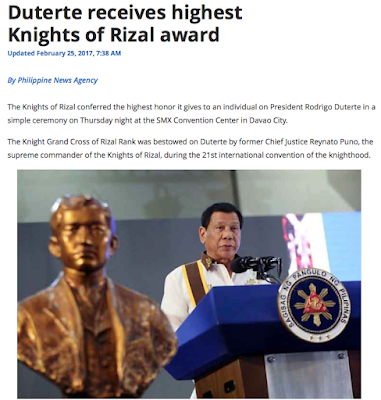 While he may have rejected the world mayor award in 2014 he did accept the highest honour bestowed by the Knights of Rizal in 2017. 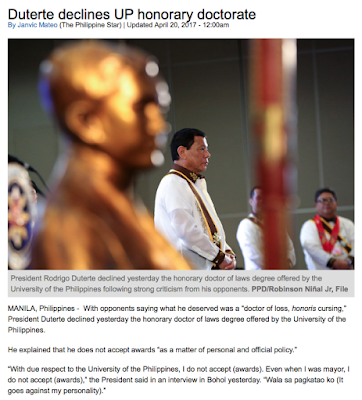 Duterte already has a law degree. What use has he for an honorary version of something he already worked hard for. But knighthood? Now who would turn that down? Even if it doesn't come with a trusty sword and steed and shiny metal armour? Is it hypocritical that Duterte declined an honorary degree from the University of the Philippines yet he himself created an even more empty and meaningless award to honour those who honour him? 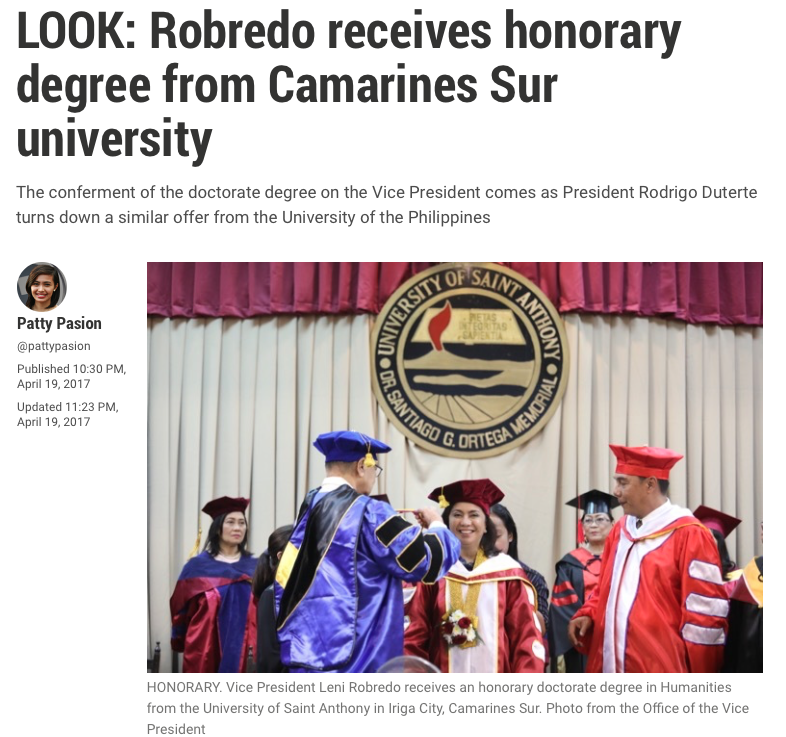 Leni Robredo had no problem accepting an honorary degree nor did anyone raise a fuss. But really though, how much honour is there in an honorary degree? Here is a list of honorary degrees bestowed upon several celebrities. Meryl Streep has three Ivy League honorary doctorates. Ben Affleck was honored with a Doctorate of Fine Arts at Brown University's 2013 commencement. P. Diddy received an honorary doctorate from the college he dropped out of. Oprah Winfrey has four honorary doctorates. J.K. Rowling has earned seven honorary doctorates on two continents. Alec Baldwin earned an honorary doctorate from his alma mater. John Legend has two honorary doctorates for his musical talents. Aretha Franklin reportedly holds some 12 or more honorary degrees, including Doctorates of Music and Arts from Princeton and University of Pennsylvania. Kanye West was honored with a doctorate from the School of the Art Institute of Chicago. Dolly Parton was honored with a Doctorate of Humane and Musical Letters from University of Tennessee at Knoxville. Jon Bon Jovi received an honorary doctorate from Rutgers University this year. Magic Johnson is the proud recipient of an honorary doctorate in business. And that list is not even complete! Lawmakers, actors, singers, musicians, architects, anyone and everyone can and has received an honorary degree. All you need to do to get one is to be nominated and approved. 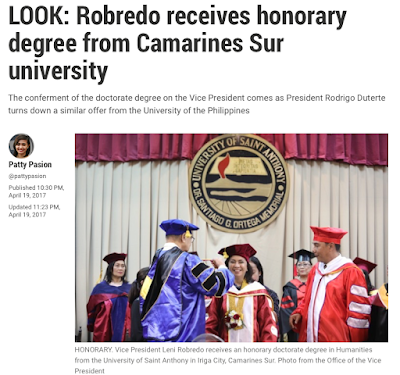 Leni Robredo accepted her one honorary degree but what is that to Aretha Franklin's twelve! Somebody needs to show Robredo a little R-E-S-P-E-C-T. 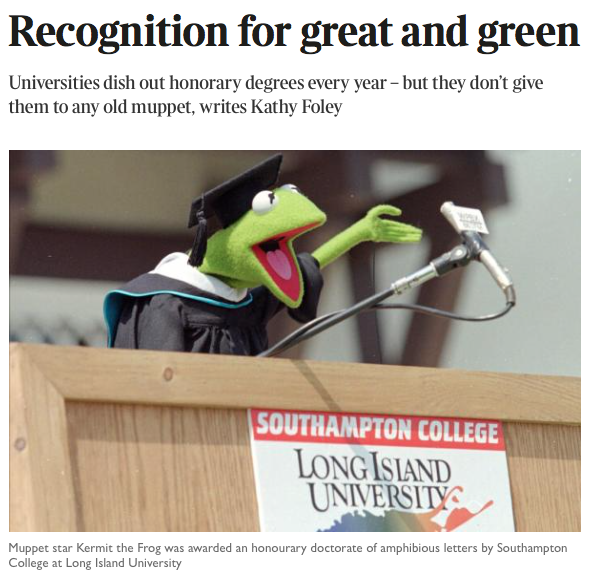 While Robredo will never be able to compete with the Queen of Soul, having one honorary doctorate puts her in the same category with Kermit the Frog who was awarded an honorary Doctor of Amphibious Letters in 1996. It's not easy being Yellow.